Cole is a historian, who, according to his website, spent an “unhappy year in medical school,’’ which may account for the stoicism of the novel’s narrator, Julius. Not only is the main character stoic, but Cole imbues the novel with the existential feel of Sartre’s Nausea and the absurdism of Camus’s The Stranger. 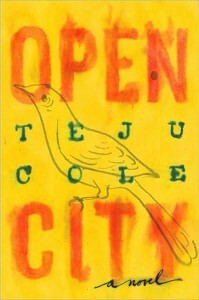 I review Teju Cole’s first novel, Open City, in the February 24 edition of The Boston Globe. You can buy Open City at Barnes & Noble.